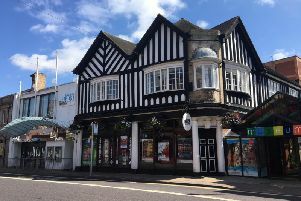 Ripley and Alfreton Musical Theatre Company is about to turn back the clock to the 80s when it performs the dynamic musical Footloose. The show features chart topping songs such as Let’s Hear It for the Boy, Holding Out For A Hero and of course the title song. While the company does not have the likes of Kevin Bacon gracing their stage, there will be Andrew Buxton, who plays the cocky teenager, Ren McCormack, who arrives in the town of Bomont from Chicago to discover that dancing has been banned. Ren then takes it upon himself to incite a revolution with his classmates to throw a dance. There is a lot of laughs, love and music along the way. This will be Andrew’s second show with the company but he has been performing with amateur companies in the area for the last three years. During this time, he has had to master the skills of puppetry in Avenue Q, lasso for Oklahoma and this year he is taking to the stage on rollerskates, although, by his own admission, he is not sure he will be fully mastering the art! The show is being performed at Alfreton Grange Arts College from March 30 to April 4 and tickets are available via the company’s website www.ramtc.org or by ringing the box office on 07955 287539.